Another Cape Town winter rainy day… a get together of friends… winter specials at The Foodbarn. You connect the dots. The whole table either orders a la carte or opts for winter specials. No problems there: we all settled on four courses (R185pp) including tasters of excellent Steenberg wines. Just the right amount of food: three courses (R165pp) might have left big eaters slightly hungry; five (R215pp) would’ve seemed piggish. From a chalkboard of alternatives there were three starters, two main courses and two desserts. 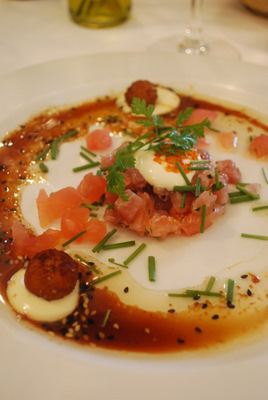 Starters sounded so good it left a few of us in a quandary – but hey, eating with friends means sharing theirs… Chunky tuna tartare with a lift of sesame oil and fresh ginger dressing was a perky little dish, served with aioli and salty salmon roe. In wine, racy Steenberg Sauvignon Blanc Reserve 2010. Soothing: crumbly textured wild mushroom ravioli with fontina cheese and truffle sauce with delicious Steenberg Nebbiolo 2009. Delightful kick: Asian kingklip and coriander Chinese dumplings with coconut milk creaminess of Tom Yum sauce and mussels. But presentation went for a loop. Magical match with Steenberg Semillon 2010. I know it’s a winter special but why is it that menus often dip into average territory with main courses? Nothing you can really put your finger on, but nothing that wows with innovation. Steenberg Catharina 2007 red blend, and tender lamb cutlets accompanied by cardamom jus, with a pastry round of quince tatin. The pumpkin and bacon risotto alternative looked vibrant, topped by a mountain of green leaves. Steenberg Merlot 2009 in wine. Warm rhubarb pudding with crème Anglaise custard swirls and vanilla pod ice cream looked like a Franck Dangereux dessert, and had many takers. Tasty and wintry, but criticised for the sponge smothering the rhubarb bits. 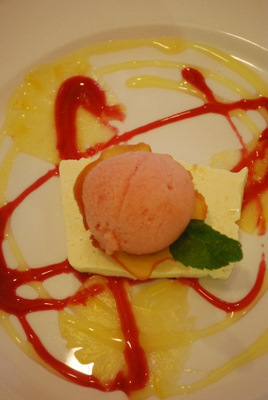 Pineapple carpaccio slivers with granadilla panna cotta and guava sorbet was tasty enough, but looked like a child had been let loose with red and yellow syryp. In short: The Foodbarn’s winter specials are satisfying and the space is surprisingly cosy in winter. Dangereux’s plates aren’t as polished and as in his La Colombe days, but he seems to be having fun. A laidback Noordhoek way of life agrees with this chef. Spend: R165pp for three courses including wine pairings, R185pp for four courses, R215pp for five courses. Flavour rating: Good food, great wines and service that isn’t in your face. THE FOODBARN, Noordhoek Farm Village, Village Lane, Noordhoek. Tel 021 789 1966, Foodbarn . Winter menus only available at lunch or dinner but not on Sundays or public holidays.